Evaluation of speech production based on marks/grades or a colour code (green = excellent to red = poor) underneath the student's speech production. 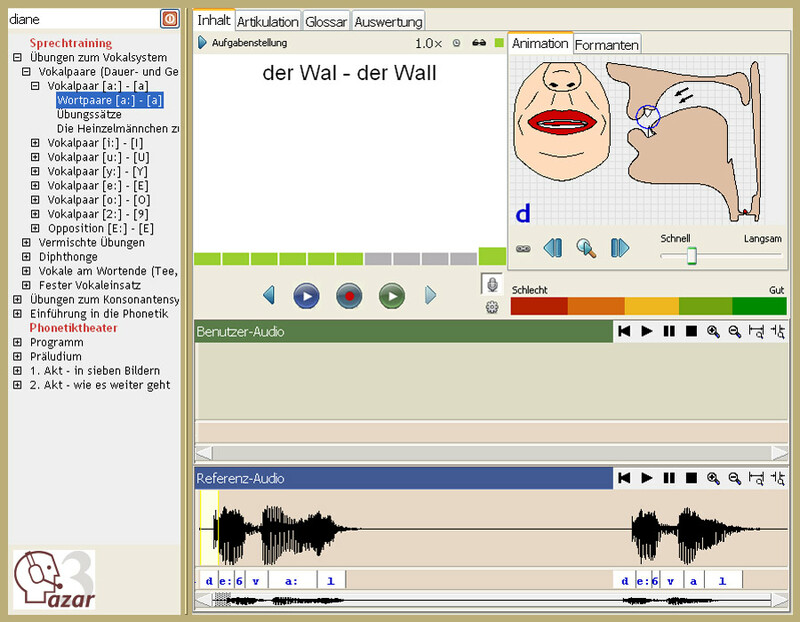 By using the interaction buttons, the student can compare his own recorded speech pattern with that of the reference speaker. 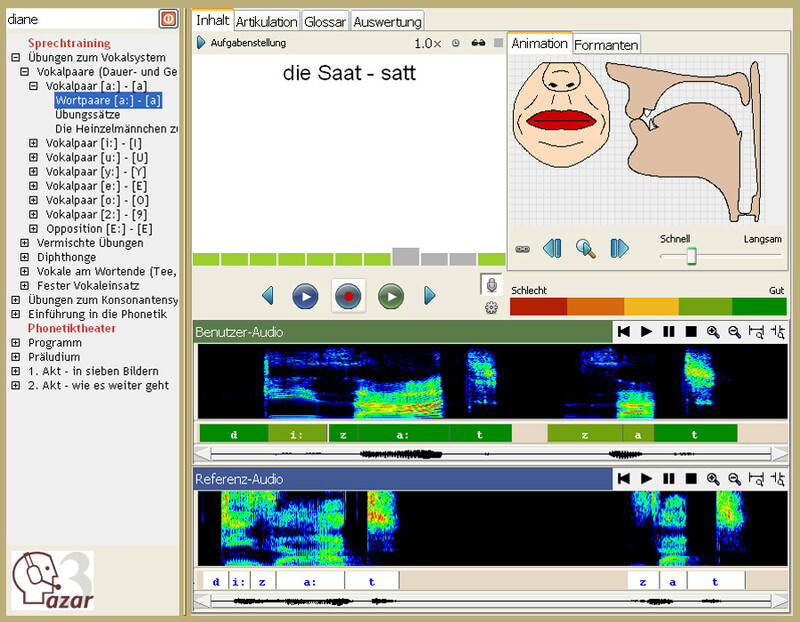 Different options for showing a waveform, a spectrogram and the speech melody, detailed comparison of the student's speech pattern and that of the reference speaker. While speaking, the speech organs are shown in a sagittal section and a front view. This allows monitoring of the correct positioning and movements of the organs during speaking and the check against the student's own speech movements. The movement of the first two energy maxima in the spectrum are typical for specific sounds and sound qualities. Formant mapping is a feedback tool for vowel production. 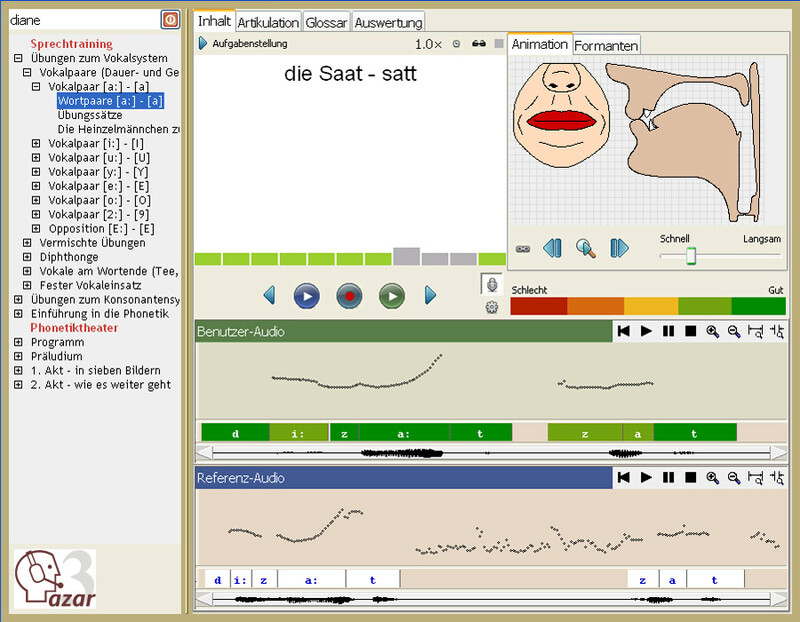 Coloured fields represent the target qualities for vowels to be reached by the student in his own sound production (as shown by individual sound symbols). The different features of this feedback technology provide an objective evaluation of the student's pronunciation and of the training status of his/her perception, evaluation and production capabilities. Thus they start off at a point where conventional teachware will fail. These tools cover the entire speech production process and make it plausible to the student. As the students are dominated by the entrenched speech production patterns of their mother tongue and, when it comes to perception, are fully restricted to the characteristics of their mother tongue as well, the characteristics of the foreign language they are learning initially constitute a problem for them. That's where AzAR comes into play. AzAR trains the phonetic feedback loop via speech perception, evaluation and production. Thus AzAR expands the limited residual capabilities adults have when trying to perceive, evaluate and reproduce foreign sound patterns. See how the feedback technologies work and watch the AzAR demo videos.